Speedwell is a small perennial plant; the creeping, woody, hairy stem sends up branches from 3 to 10 inches high and is rooted at the joints. 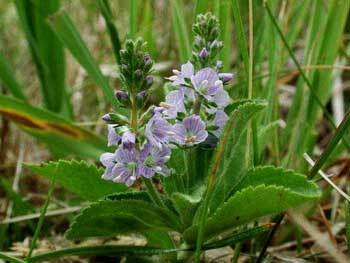 The opposite, oblong, grayish-green leaves are soft and have finely toothed margins. The light blue flowers have violet streaks and grow in dense, axillary, spikelike racemes from May to August. The fruit is an obovate, compressed, hairy capsule. Another variety: Thyme-leaved speedwell (V. serpyllifolia); leaf juice used by Native Americans for earaches; leaves poulticed for boils; tea used for chills and coughs. Found in dry meadows, waste places, fields, and woods over the eastern half of North America, as far south as North Carolina and Tennessee. Similar in flavor to Chinese green tea, Speedwell tea is a common tea in Europe and is, in fact, known there as The` de l’Europe. Of the 20 or so Veronica species that occur in North America, almost all are naturalized weeds from Europe and Asia. They are often found growing on lawns in the United States. Most species have blue veins on violet-blue flowers, and a whitish center. A tonic, used in cough, catarrh, asthma, lung diseases, kidney ailments, rheumatism, jaundice, promotes sweating, urination, and menses, and for skin diseases. Primarily used as an expectorant in respiratory problems. Used for stomach ailments, migraine headaches, and as a gargle for mouth and sore throat sores. The fresh juice is taken in large quantities for gout, and it can be used externally to relieve chronic skin problems. Infusion: steep 2 tsp. flowering herb in 1/2 cup boiling water. Take 1 to 1 1/2 cups a day, a mouthful at a time. Juice: take 2 tsp. in water or milk, 3 times a day. One component, aucubin, though liver-protective, anti-oxidant, and antiseptic, can be toxic in grazing animals.